Today we’re in the granddaughters bedroom. The brightest room in our house. You guys know how I’m always changing things up. 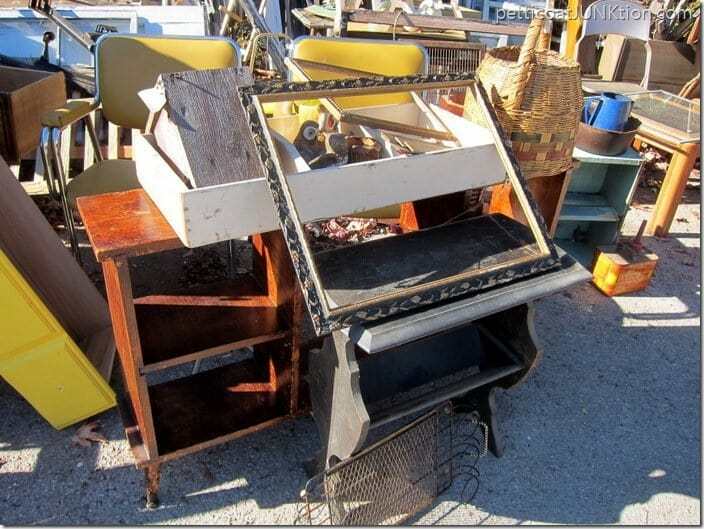 Usually it’s either wall décor, mantel makeovers, or furniture swapping. When the JTS and I were first married we were living in Tacoma, Washington. The hubby was in the U. S. Military for 26 years. Me being a newlywed and a few thousand miles away from home I got a little bored. The JTS was gone a lot of the time and I would redecorate the house weekly. If he happened to come home from a trip and it was nighttime….well, let’s just say he ran into or tripped over furniture regularly. The furniture moving continues even though he’s been retired for several years now. 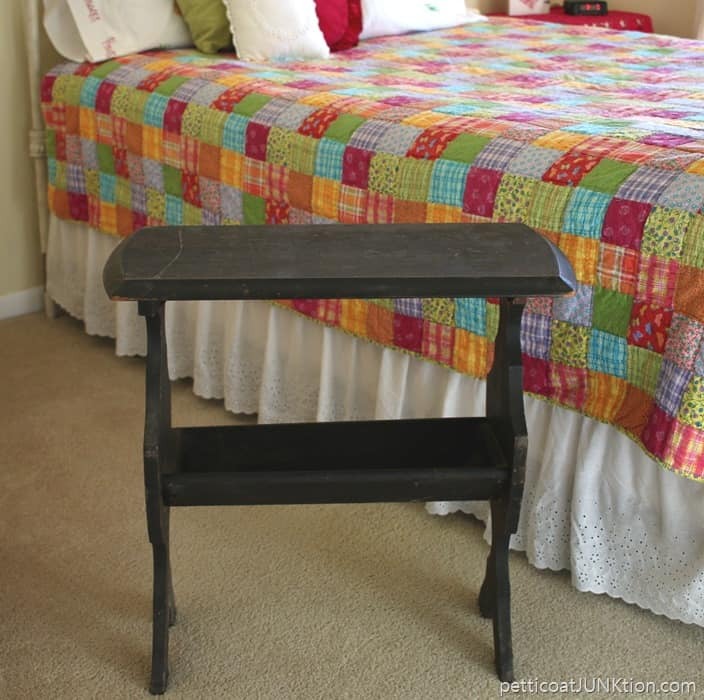 This table is the latest furniture piece to leave the house. I don’t even remember what was in it’s spot before I put the table there temporarily a few months ago. There may not have been anything there come to think of it. The table never did fit the space so I painted a vintage table just for this spot. I bought it at My Favorite Junk Shop in November. I’m not sure how much I paid for it but I’m guessing $5 or $10. I almost just cleaned and waxed the table. I like the dark finish. I decided to showcase a little of the original finish and I taped off two stripes using FrogTape. I grabbed a can of oops paint from the shelf and applied two coats of paint. When I first opened the top on this can of paint I cringed. Really. It just looked, not good. 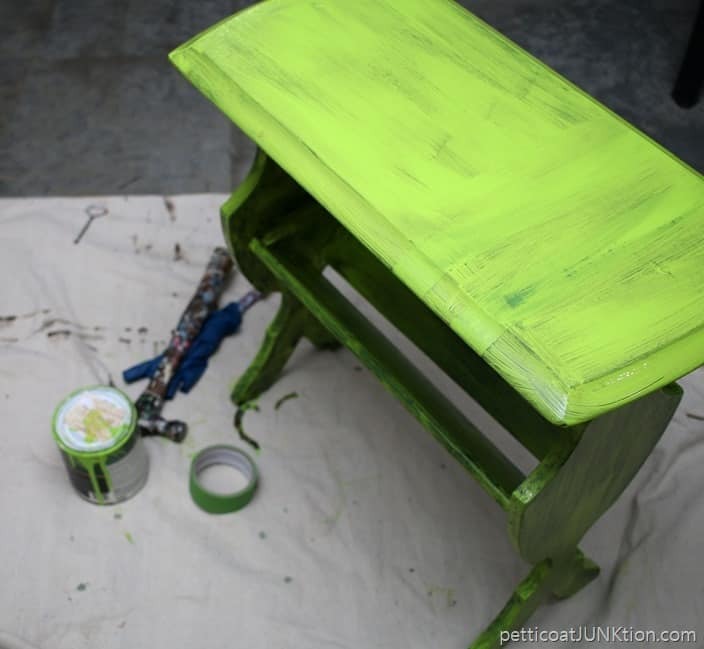 I used it as an accent color on a few pieces of furniture then went all out on this nightstand…. I guess the paint looks better when dry than it does in the can. 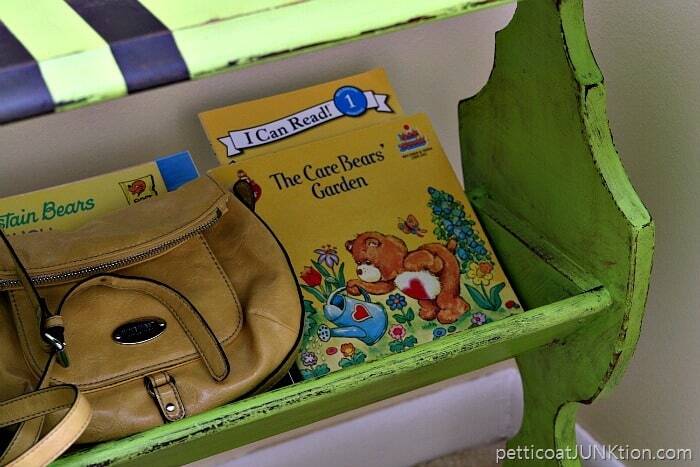 You can see the Green Nightstand Navy Blue Bed post here. 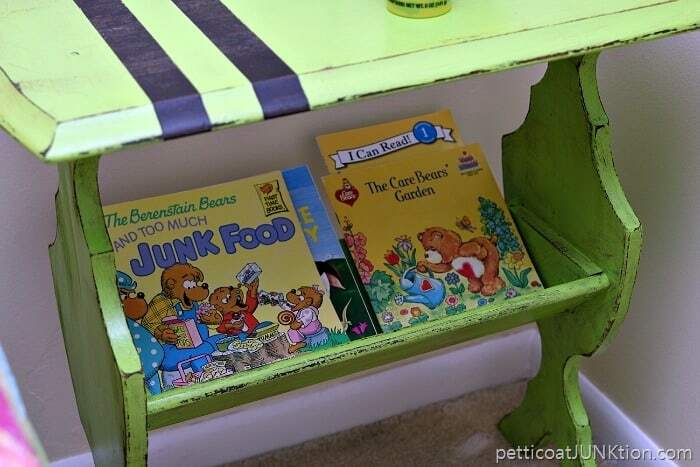 I recently received a message on Facebook from a lady asking about painting her son’s bedroom furniture in the Seattle Seahawks colors and I realized this project was pretty close. I sent her the photos as inspiration. I removed the FrogTape as soon as I was finished painting the table. If you wait until the paint is dry then some of the paint may peel off with the tape. See how nice and sharp those lines are. I love FrogTape! I distressed the paint by hand using 100 grit sandpaper. Next I rubbed Howards Wax in Golden Oak all over the table. The paint is a gloss finish and I wanted to cut the shine a little. 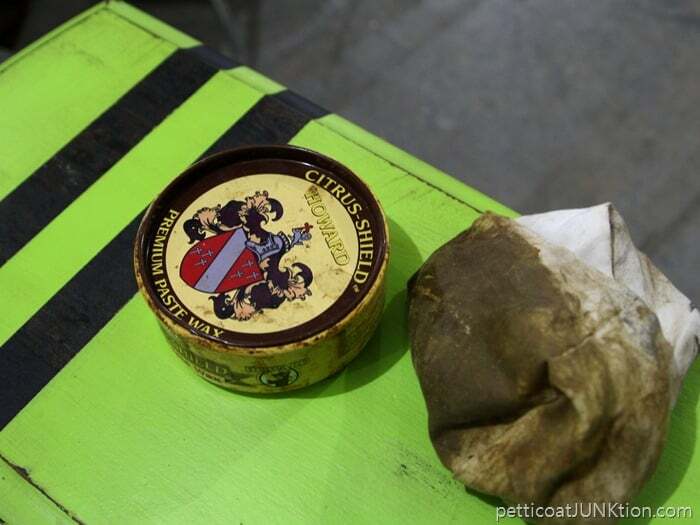 I also use the wax to antique or age painted furniture. The wax works great on paint with a flat sheen. I put a few of the girls things in the tray. That Care Bear book is one we had when my son was little. I think it’s very fitting to put the books in the table because the two granddaughters I talk about all the time belong to our son. Our daughter has two sons. Isn’t it funny how things work out. Anyone out there remember those cuddly little Care Bears? Big Bird is holding down the fort. 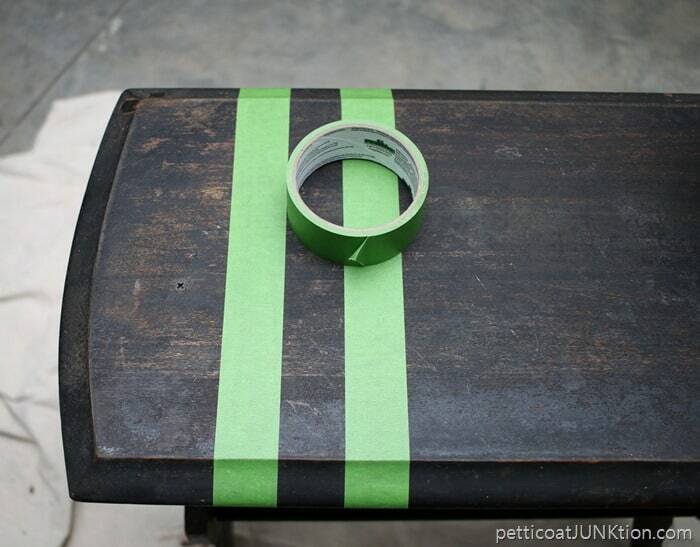 What do you think of the Bold Green Painted Table…..do you like the sassy stripes? Hope you guys have a great day, I’m off to my college classes! 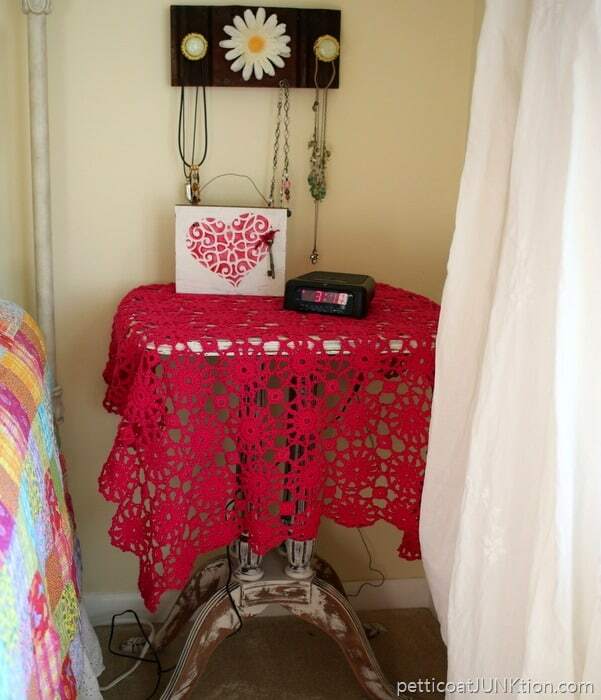 What a great little table Kathy! 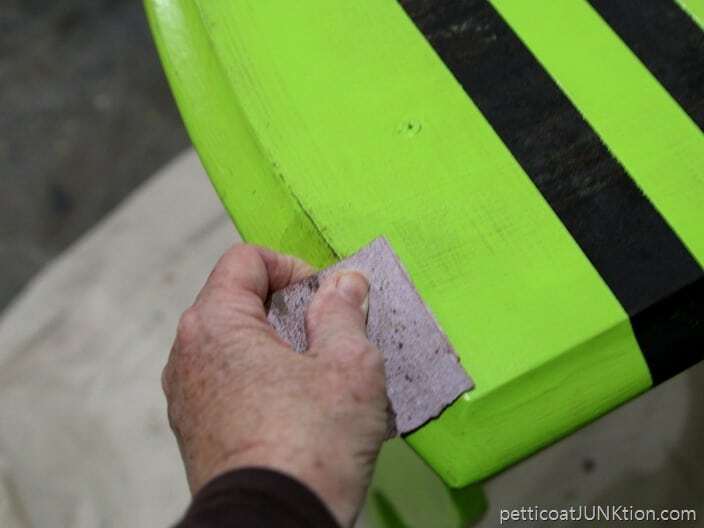 Once you put the dark wax on the green, it completely transformed the color and gave it some depth. The distressing adds so much too and the stained stripes are perfect. Pinning to share. Its adorable and I like that you created the stripes with the original finish. 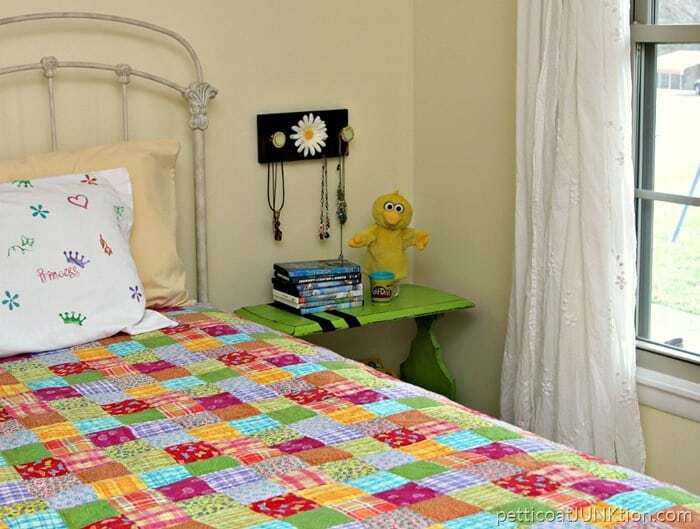 It looks so cheery next to that bed quilt. I agree with Effie. 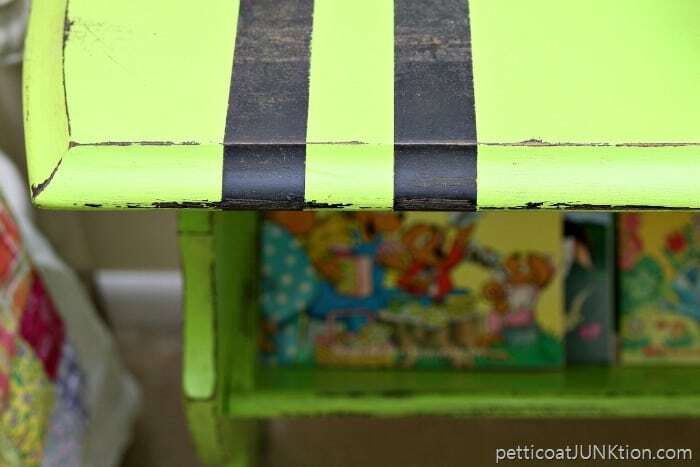 The shade of green is perfect for the room, but the stripes don’t work with the style of the table or the theme of the room. 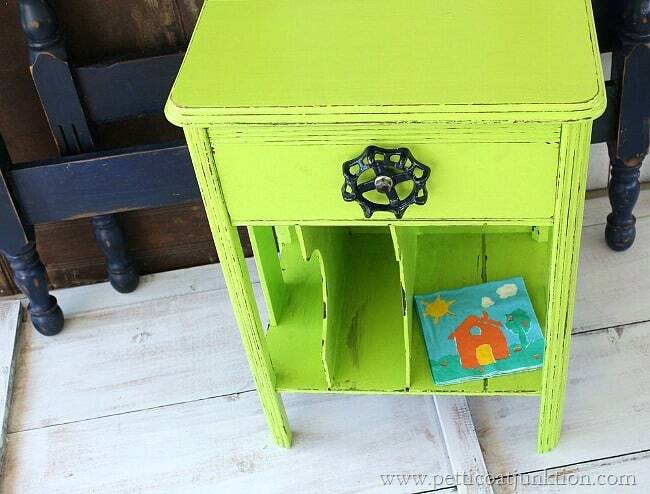 It is lots of fun to paint something a different color. This turned out very nice. I like the color of the table but not the stripes so much.